A recurring theme used in the Bible to describe the state of man in the last days is "lawlessness." Now, I know that "lawlessness" as referred to on many occasions in the Bible means much more than small-time hoods knocking over liquor stores or mafia dons running numbers and prostitution rings. I believe the "lawlessness" that is prophesied to characterize the last-days will be a general state of disregard and disdain for the righteous and holy, the good, the right, the lawful, even the civil. It goes without saying that we'll see a rise in crime as the end approaches and Satan expands his influence in this world. But the Bible indicates we'll see other expressions of "lawlessness," too. We Americans have been blessed to live our lives in this Republic that is founded on laws, not the whims of men. This "society of laws" is guaranteed by our Constitution, perhaps one of history's grandest, most unique documents. But we are witnessing a continuous erosion of the rights and liberties guaranteed by the Constitution. As our leaders display less regard for the authority of the founding document, our society suffers. This administration has shown that it values its own ideology above the US Constitution. Charged with upholding the nation's laws, it has willfully refused to enforce or defend those laws on more than one occasion. 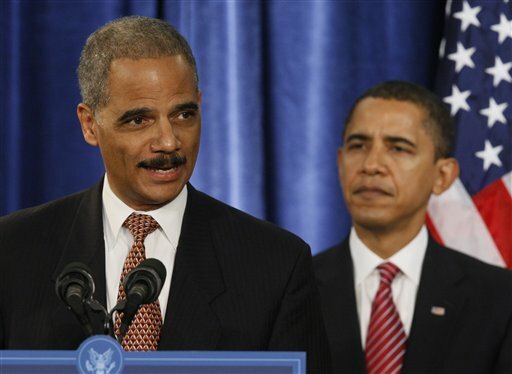 Attorney General Eric Holder refused to defend the "Defense of Marriage Act," refused to prosecute the New Black Panthers for blatant voter intimidation, and turned a blind eye to "Operation Fast and Furious." The administration refuses to enforce existing immigration law and sued those states who did. It illegally engaged in military adventures without the concurrence of Congress. It charged in to bail out corporations, took ownership stakes, and saw to it that its union cronies were rewarded before secured creditors. It even forcibly passed an omnibus healthcare program that broke all convention to force all citizens to purchase a product - legislation that will almost certainly be declared unconstitutional next year. It has consistently circumvented the other branches of the federal government by taking actions administratively that have been forbidden by the courts or the Congress. And those are just some of the things we know about! So, if the very ones charged by the Constitution with upholding the law are themselves engaged in lawlessness, what does that portend for the rest of our society? And for our future? The latest example of the administration's refusal to uphold the law involves the State Department. US law requires that the place of birth for any US citizen born in Jerusalem be listed in his or her passport as "Jerusalem, Israel." The State Department, which issues American passports, ignores that law and, instead, lists the place of birth as simply "Jerusalem." No mention of Israel. Could the motive be any more obvious? The Muslims and Palestinians do not want Jerusalem to be identified as part of Israel. And since the administration is obsessed with pleasing the Muslims and Palestinians, but couldn't care less about what the Jews and Israelis want, they refuse to obey the law. Not only does this demonstrate a disdain for our entire system of law, but it illustrates the administration's anti-Israel bias. The Supreme Court has now agreed to hear a case involving this issue. As a result, Secretary of State Hillary Clinton now has to defend her refusal to uphold a law that she voted FOR when she was a senator from New York. The Bible predicts that between man's "sin nature" and Satan's desire to "kill and destroy" God's creation, lawlessness will one day engulf the world. In fact, it predicts that the world will be completely controlled by a person it describes precisely as the "lawless one" - the Antichrist. The only thing that prevents that from happening today is the presence in the world of the "restrainer of lawlessness" - the Holy Spirit. But someday soon, God the Father will decide that the world has finally chosen "lawlessness" and He will remove the Restrainer. And since the Restrainer indwells all true believers, that means He can only be removed if WE are removed from this earth. That's what we refer to as "the Rapture." Don't miss that escape. Trust me, you do not want to be on this earth when lawlessness reigns. I'll bet you thought Karl Marx was an obscure German philosopher who wrote a couple of books in the 19th century that are now gathering dust on library shelves around the world. Wrong! The works of Karl Marx, most notably "Das Kapital" and "The Communist Manifesto," are alive and well. In fact, they're apparently the guiding documents of much of what we see happening in America today. If anyone tries to tell you that Marxism, Socialism, and, believe it or not, Communism are hazy ghosts from the ancient past, don't believe them. Marxism is the guiding philosophy of the current administration, socialism is its determined goal, and communism may well be the result of its efforts if it gets its way and another four years. If you don't believe me, just read the signs and placards of the "Occupy Wall Street" movements that the administration has lustily embraced. Further, just look at the destructive spending and smothering regulatory programs that the administration pursues with "ram it down your throat" tactics. These are not just the miscalculations of a naive and incompetent leadership. These are considered, purposeful actions designed to crash and destroy capitalism and our way of life so that another can be instituted in its place. Far be it from me to say to America, "Wake up and smell the coffee," but, America, wake up and smell the coffee! And Believers, wake up and seek God's mercy on our great nation! Finally, the world's most famous hostage, Israeli IDF sergeant Gilad Shalit, is home at last. He was released by Hamas on Tuesday. To win his freedom, Israel agreed to release 1,027 Palestinian prisoners, including about 400 with "blood on their hands." That means they were directly linked to the deaths of Israeli Jews in terrorism attacks. The debate now begins over whether Israel paid too high a price for this lone soldier's freedom. Whatever the conclusion, it illustrates one thing perfectly: Judeo and Christian societies value Life. Muslim societies value Death. For the Israelis, one young Jewish life is worth 1,000 terrorists and murderers. For the Palestinians, the return of 1,000 terrorists and murderers as "heroes" is worthy of celebration.